The Commonwealth of Australia is a nation strategically located between the Indian and Pacific Oceans with strong cultural and political ties to North America and Europe. The world's sixth largest country and an island continent occupied by a single nation, its name is derived from the Latin Australis, meaning "of the South." It is sometimes referred to as the "land down under," a reference to its long distance from its mother country, Britain. Initially a site for English penal colonies in the eighteenth and nineteenth centuries as well as a base of British economic exploitation of the area, Australia grew to become a constitutional democracy whose people built a nation free of the limitations prevalent in crowded England. Australia has developed a robust economy and high living standard. Although arid throughout much of its surface, part of its prosperity came from its extensive mineral resources. Once considered geographically isolated, Australia today benefits from its proximity to both East Asia and South Asia, and overall plays an increasingly important role in the Asia-Pacific. Within Oceania itself, Australia exercises crucial leadership, both as a benefactor to island nations and through its ability to project military power. Australia, pronounced “ors-trial-ya” by the country's inhabitants, is a 7,686,850 square kilometer (3,074,740 square mile) landmass on the Indo-Australian Plate, slightly smaller than the contiguous 48 states of the United States. It is surrounded by the Indian and Pacific Oceans, and the Tasman Sea. Australia is separated from Asia by the Arafura and Timor seas. Neighboring countries include Indonesia, East Timor, Irian Jaya and Papua New Guinea to the north; the Solomon Islands, Vanuatu and the French dependency of New Caledonia to the northeast; with New Zealand to the southeast. Australia has a total 25,760 kilometers (15,970 miles) of coastline and claims an extensive Exclusive Economic Zone of 8,148,250 square kilometers (3,259,300 square miles). The Great Barrier Reef, the world's largest coral reef, lies a short distance off the northeast coast and extends for 2,000 kilometers (1,240 miles). The world's largest monolith, Mount Augustus, is located in Western Australia. At 2,228 meters (7,350 feet), Mount Kosciuszko on the Great Dividing Range is the highest mountain on the mainland, although Mawson Peak on the remote Heard Island and McDonald Island is taller at 2,745 meters (9,058 feet). Tectonic uplift of mountain ranges or clashes between tectonic plates occurred in Australia's early history, when it was still a part of Gondwana. Erosion has heavily weathered Australia's surface, making it one of the flattest countries in the world. Much of Australia is desert or semi-arid. Only the southeast and southwest corners of the continent have a temperate climate and moderately fertile soil. The north, with a tropical climate, has rainforest, woodland, grassland and desert. Climate is influenced by ocean currents, including the El Niño southern oscillation, which brings periodic drought, and the seasonal tropical low pressure system that produces cyclones in northern Australia. 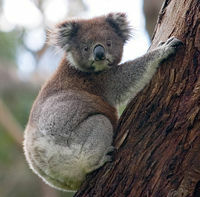 The Koala and the Eucalyptus make an iconic pair of Australian flora and fauna. Rainfall is variable, with frequent droughts lasting several seasons. Dust storms can blanket a region or even several states. The Great Artesian Basin, an important source of water for people and cattle in the parched outback region, is the world's largest and deepest fresh water basin. Natural hazards include cyclones along the northern coasts, severe thunderstorms, droughts and occasional floods as well as frequent bushfires. Natural resources include: bauxite, coal, iron ore, copper, tin, gold, silver, uranium, nickel, tungsten, mineral sands, lead, zinc, diamonds, natural gas and petroleum. Arable land constitutes six percent of land use, permanent pastures make up 54 percent, forests and woodlands cover 19 percent. 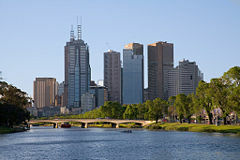 The capital city is Canberra, although the population is concentrated in the large coastal cities of Sydney, Melbourne, Brisbane, Perth, and Adelaide. Most Australian woody plant species are evergreen and many are adapted to fire and drought, including many eucalypts and acacias. There is a rich variety of endemic legume species that thrive in nutrient-poor soils because of their symbiosis with Rhizobia bacteria and fungi. Well-known fauna include the platypus and echidna; a host of marsupials, including the koala, kangaroo, wombat; and birds such as the emu, and kookaburra. The dingo was introduced by Austronesian people that traded with indigenous Australians around 4000 B.C.E. Many plant and animal species became extinct after human settlement, including the Tasmanian Tiger. The first Australians, ancestors of the current indigenous Australians, arrived via land bridges and short sea-crossings from Southeast Asia between 42,000 and 48,000 years ago. Most were hunter-gatherers, with an oral culture and spiritual values based on reverence for the land and a belief in a mythological “dreamtime.” The Torres Strait Islanders, ethnically Melanesian, possess cultural practices that are different from the Aborigines. Dutch navigator Willem Jansz sighted Cape York Peninsula in 1606, becoming the first European to do so. The Dutch charted the western and northern coastlines of what they called New Holland in the seventeenth century, but made no attempt at settlement. Lieutenant James Cook charted the East coast of Australia on HM Bark Endeavour, claiming the land for Britain in 1770. 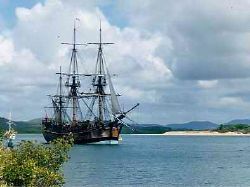 This replica was built in Fremantle, Western Australia in 1988; photographed in Cooktown harbour where Cook spent 7 weeks. In 1770, James Cook sailed along and mapped the east coast of Australia, which he named New South Wales and claimed for Britain. This led to the establishment of a penal colony there. The transportation of convicts to Australia was phased out between 1840 and 1864. The British Crown Colony of New South Wales started with the establishment of a settlement at Port Jackson by Captain Arthur Phillip on January 26, 1788. This date was to become Australia's national day, Australia Day. Van Diemen's Land, now known as Tasmania, was settled in 1803. The United Kingdom formally claimed the western part of Australia in 1829. Separate colonies were created from parts of New South Wales: South Australia in 1836, Victoria in 1851, and Queensland in 1859. The Northern Territory was founded in 1863 as part of the Province of South Australia. The indigenous Australian population, estimated at about 350,000 at the time of European settlement, declined steeply for 150 years following settlement, because of infectious disease, forced re-settlement and cultural disintegration. The treatment of indigenous people is hotly debated within Australia. After the Australian referendum in 1967, the federal government gained the power to implement policies and make laws with respect to Aborigines. Traditional ownership of land—native title—was not recognized until the High Court of Australia case Mabo v Queensland (No. 2) overturned the notion of Australia as terra nullius at the time of European occupation. A gold rush began in the early 1850s, and the Eureka Stockade rebellion in 1854 was an early expression of nationalist sentiment. Between 1855 and 1890, the six colonies individually gained responsible government. On January 1, 1901, the colonies federated and the Commonwealth of Australia was born as a Dominion of the British Empire. The Australian Capital Territory (ACT) was formed in 1911 to provide a location for the federal capital of Canberra (Melbourne was the capital from 1901 to 1927). The Last Post is played at an ANZAC Day ceremony in Port Melbourne, Victoria, on April 25, 2005. Ceremonies such as this are held in virtually every suburb and town in Australia. Australia willingly participated in World War I in which 59,330 Australians lost their lives. Many Australians regard the defeat of the Australian and New Zealand Army Corps (ANZACs) at the Battle of Gallipoli as the birth of the nation. It was Australia's first major military action. The Kokoda Track Campaign is regarded by many as a nation-defining battle from World War II. A total of 40,400 Australians died in that war. Seventeen thousand served in the Korean War. The Statute of Westminster (1931) formally ended most constitutional links between Australia and the United Kingdom, but Australia did not adopt the statute until 1942. The shock of the United Kingdom's defeat in Asia in 1942 and the threat of Japanese invasion caused Australia to turn to the United States as a new ally and protector. From 1951, Australia has been a formal military ally of the U.S. under the auspices of the ANZUS treaty. After World War II, Australia encouraged mass immigration from Europe. Beginning in the 1970s and the abolition of a White Australia policy, immigration from Asia and other parts of the world was encouraged. The final constitutional ties between Australia and the United Kingdom ended in 1986 with the passing of the Australia Act 1986, ending judicial appeals to the United Kingdom Privy Council. Australian voters rejected a move to become a republic in 1999 by a 55 percent majority. The Commonwealth of Australia is a constitutional monarchy and has a parliamentary system of government. Queen Elizabeth II is the Queen of Australia, and is represented by the Governor-General of Australia, at federal level, and by the governors at state level. 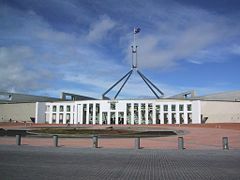 New Parliament House in Canberra was opened in 1988, replacing the Old Parliament House in Canberra. The provisional Parliament House building opened in 1927. The parliament, or legislative branch of government, consists of an upper house, or senate, of 76 senators, and a lower house, or House of Representatives, of 150 members. Members of the lower house are elected from single-member constituencies, commonly known as “electorates,” allocated to states on the basis of population. Elections for both chambers are held every three years. The party with majority support in the House of Representatives forms government, with its leader becoming prime minister. The executive comprises the Queen, represented by the governor-general, the prime minister, and a cabinet nominated by the Prime Minister. The judiciary, the third branch of government, consists of the High Court, other federal courts and state courts, all of which became formally independent of the Judicial Committee of the Privy Council in London when the Australia Act was passed in 1986. The legal system is based on English common law. There are three main political parties: the Australian Labor Party, the Australian Liberal Party and the National Party. Independent members and several minor parties—including the Greens, Family First and the Democrats—have achieved representation mostly in the upper house. Australia consists of six states: New South Wales, Queensland, South Australia, Tasmania, Victoria, and Western Australia. 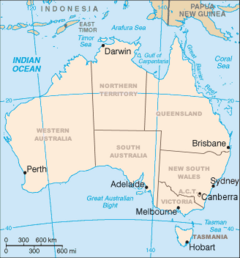 Two major mainland territories are the Northern Territory and the Australian Capital Territory. The state parliaments control hospitals, education, police, the judiciary, roads, public transport and local government. Each state and territory has its own parliament. The federal government administers a separate area within New South Wales, the Jervis Bay Territory, as a naval base and sea port for the national capital. External territories include: Norfolk Island, Christmas Island, the Cocos (Keeling) Islands, and the largely uninhabited Ashmore and Cartier Islands, Coral Sea Islands, Heard Island, and McDonald Islands, and the Australian Antarctic Territory. Australia's foreign relations have been driven by a close association with the United States, through the ANZUS pact and by a desire to develop relationships with Asia and the Pacific, particularly through the Association of Southeast Asian Nations (or ASEAN) and the Pacific Islands Forum. Australia is a member of the Commonwealth of Nations. Much of Australia's diplomatic energy is focused on international trade liberalization. It is a founding member of the United Nations, and extends aid to 60 countries. Australia's armed forces—the Australian Defence Force—comprise the Royal Australian Navy, the Australian Army, and the Royal Australian Air Force. All branches of the ADF have been involved in UN and regional peacekeeping, most recently in East Timor, the Solomon Islands and Sudan, disaster relief, and armed conflict, including the 2003 invasion of Iraq. The forces, while numerically small compared to some in the region, consist of volunteers and are held in high regard as a well-trained force equipped with modern weapons. Australia has a prosperous, Western-style mixed economy, with a per capita gross domestic product (GDP) slightly higher than those of the UK, Germany, and France. In recent years, the Australian economy has been resilient in the face of global economic downturn. Rising output in the domestic economy has been offsetting the global slump, and business and consumer confidence remains robust. In 1983, the Labor Party, led by Prime Minister Bob Hawke and Treasurer Paul Keating, started economic reform by floating the Australian dollar, and deregulating the financial system. Since 1996, the Howard government partially deregulated the labor market and privatized the communications industry. The introduction of a 10 percent goods and services tax, in July 2000, reduced a heavy reliance on personal and company income tax. The Australian economy has not suffered a recession since the early 1990s. The service sector, including tourism, education, and financial services, comprises 69 percent of GDP. Agriculture and natural resources comprise only 3 percent and 5 percent of GDP respectively, but contribute substantially to Australia's export performance. Australia's largest export markets include Japan 18.7 percent, People's Republic of China 9.2 percent, the United States 8.1 percent, South Korea 7.7 percent and New Zealand 7.4 percent. Export commodities include coal, gold, meat, wool, alumina, iron ore, wheat, machinery and transport equipment. Import commodities include machinery and transport equipment, computers and office machines, telecommunication equipment and parts; crude oil and petroleum products. Partners are the U.S., 14.8 percent, China 12.7 percent, Japan 11.8 percent, Germany 5.8 percent, Singapore 4.4 percent, and the United Kingdom 4.1 percent. Most Australians are descended from nineteenth and twentieth-century immigrants from Great Britain and Ireland. Australia's population has quadrupled since the end of World War I, spurred by an ambitious immigration program. A policy of multiculturalism has been established to promote racial harmony. The self-declared indigenous population—including Torres Strait Islanders, who are of Melanesian descent—was 410,003 (2.2 percent of the total population) in 2001, a significant increase from the 1976 level of 115,953. Indigenous Australians have higher rates of imprisonment and unemployment, lower levels of education and shorter life expectancies. Perceived racial inequality is an ongoing political and human rights issue for Australians. Fewer than 15 percent of Australians live in rural areas. This picture shows the Barossa Valley wine-producing region of South Australia. The population is aging, with more retirees and fewer people of working age. A large number of Australians live outside their home country. English is the official language. Australian English is the only language spoken in the home for around 80 percent of the population. Chinese is spoken by 2.1 percent, Italian by 1.9 percent and Greek, 1.4 percent. Many migrants are bilingual. 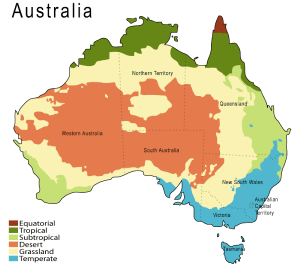 There were between 200 and 300 Australian Aboriginal languages at the time of first European contact. Only 70 of these languages have survived, and all but 20 are now endangered. An indigenous language remains the main language for about 50,000 (0.02 percent) people. Australia has a sign language known as Auslan, which is the main language of about 6,500 deaf people. Australia has no state religion. Section 116 of the Australian Constitution prohibits the federal government from making any law to establish any religion, impose any religious observance, or prohibit the free exercise of any religion. School attendance is compulsory between the ages of six and 15 years (16 years in South Australia and Tasmania, and 17 years in Western Australia), contributing to an adult literacy rate of 99 percent. Government grants have helped establish and fund Australia's 38 universities. Several private universities exist. There is a state-based system of vocational training colleges, known as Technical and Further Education Institutes, and trades conduct apprenticeships. Golden Summer, Eaglemont Eaglemont, Victoria by Arthur Streeton (1889) is an early example of the rich tradition of Australian landscape painting. The culture until the mid-twentieth century was Anglo-Celtic, although distinctive Australian features had been evolving from the environment and Australian Aborigine culture. American popular culture, particularly television and cinema, has had a heavy influence over the past 50 years, as has large-scale immigration from non-English-speaking countries, and Australia's Asian neighbors. The vigor and originality of the arts in Australia—films, opera, music, painting, theater, dance, and crafts—are achieving international recognition. Australia has a long history of visual arts, starting with the cave and bark paintings of its indigenous peoples. From the time of European settlement, a common theme in Australian art has been its landscape. The traditions of indigenous Australians are transmitted orally. Australian Aboriginal music, dance and Australian Aboriginal art influence contemporary Australian visual and performing arts. Albert Namatjira is a well-known Aboriginal painter. Many ballet and theater companies receive funding through the federal government's Council for the Arts. There is a symphony orchestra in each capital city, and a national opera company, Opera Australia, first made prominent by the renowned diva Dame Joan Sutherland. Australian music includes classical, jazz, and many popular music genres. Australian literature has also been influenced by the landscape; the works of writers Banjo Paterson and Henry Lawson captured the experience of the Australian bush. The character of colonial Australia, as embodied in early literature, shows an emphasis on egalitarianism, mateship, and anti-authoritarianism. In 1973, Patrick White was awarded the Nobel Prize in Literature, the only Australian to have achieved this. Australian English is a major variety of the English language. Its grammar and spelling are largely based on those of British English, overlaid with a rich vernacular of unique lexical items and phrases. Australia has two public broadcasters, the Australian Broadcasting Corporation and the Special Broadcasting Service, three commercial television networks, three pay TV services, and numerous public, non-profit television and radio stations. Australia's film industry has achieved critical and commercial successes, as have quite a number of its actors and actresses. Each major city has daily newspapers, and there are two national daily newspapers, The Australian and The Australian Financial Review. 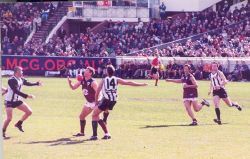 Australian rules football was developed in Australia and is played at amateur and professional levels. According to “Reporters Without Borders” in 2005, Australia is in 31st position on a list of countries ranked by freedom of the press, behind New Zealand (9th) and the United Kingdom (28th) but ahead of the United States, due to limited media ownership; major print media are owned by either News Corporation or John Fairfax Holdings. Sport is important, assisted by a climate that favors outdoor activities; 23.5 percent Australians over the age of 15 regularly participate in an organized sport. Australia has particularly strong international teams in cricket, field hockey, netball, rugby league, rugby union, and performs well in cycling and swimming. Other sports include Australian rules football, soccer, and motor racing. Australia has participated in every summer Olympic Games and every Commonwealth Games. Australia has hosted the 1956 Summer Olympics and 2000 Summer Olympics, and has ranked among the top five medal-takers since 2000. Australia has also hosted the 1938 British Empire Games, 1962 British Empire and Commonwealth Games, 1982 Commonwealth Games and 2006 Commonwealth Games. Other major international events held regularly in Australia include the Australian Open, one of the four Grand Slam tennis tournaments, and the Formula One Australian Grand Prix. 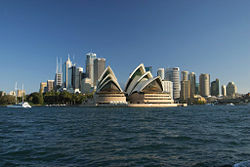 ↑ Australia also has a royal anthem, "God Save the Queen (or King)," which is played in the presence of a member of the Royal family when they are in Australia. In all other appropriate contexts, the national anthem of Australia, "Advance Australia Fair," is played. See Australian National Anthem Retrieved September 20, 2018; National Library of Australia, Parliamentary Handbook of the Commonwealth of Australia (University of Michigan Library, 2010). ↑ Pluralist Nations: Pluralist Language Policies? Global Cultural Diversity Conference Proceedings, Sydney, 1995. Department of Immigration and Citizenship. Retrieved October 27, 2017. "English has no de jure status but it is so entrenched as the common language that it is de facto the official language as well as the national language." ↑ Arthur Delbridge, The Macquarie Dictionary (Macquarie Library, 1982, ISBN 978-0949757005). ↑ Collins, Collins English Dictionary (Collins, 2011, ISBN 978-0007437863). ↑ Population clock Australian Bureau of Statistics. Commonwealth of Australia. Retrieved September 20, 2018. The population estimate shown is automatically calculated daily at 00:00 UTC and is based on data obtained from the population clock on the date shown in the citation. ↑ 2016 Census QuickStats Australian Bureau of Statistics. Retrieved September 20, 2018. ↑ 7.0 7.1 7.2 7.3 Australia International Monetary Fund, October 2016. Retrieved September 20, 2018. ↑ OECD Economic Surveys: Norway 2012. Retrieved September 20, 2018. ↑ 2016 Human Development Report United Nations Development Programme. Retrieved September 20, 2018. ↑ 10.0 10.1 There are minor variations from these three time zones. ↑ Commonwealth of Australia Constitution Act - Sect 116 Commonwealth Consolidated Acts. Retrieved September 20, 2018. This page was last modified on 20 September 2018, at 20:38.